Upon arrival in Thessaloniki, His Holiness Patriarch Kirill of Moscow and All Russia, the members of the official delegation of the Russian Orthodox Church, Metropolitan Anthimos of Thessaloniki, Metropolitan Prokopios of Nea Krini and Kalamaria, and Metropolitan Nikodemos of Kassandreia went to the Cathedral of St. Gregory Palamas. They were met by the local clerics in the cathedral filled with Orthodox Christians from different countries. Attending the service were also Minister Theodoros Karaoglou for Macedonia and Thrace, Russian Consul General to Thessaloniki A. Popov, and Mayor of Thessaloniki Yannis Boutaris. After the prayer service, Metropolitan Anthimos greeted His Holiness Kirill and said that the Russian Church was the largest Orthodox Church and was spreading the word of God allover the world, thus continuing the apostolic mission of Ss Cyril and Methodius. 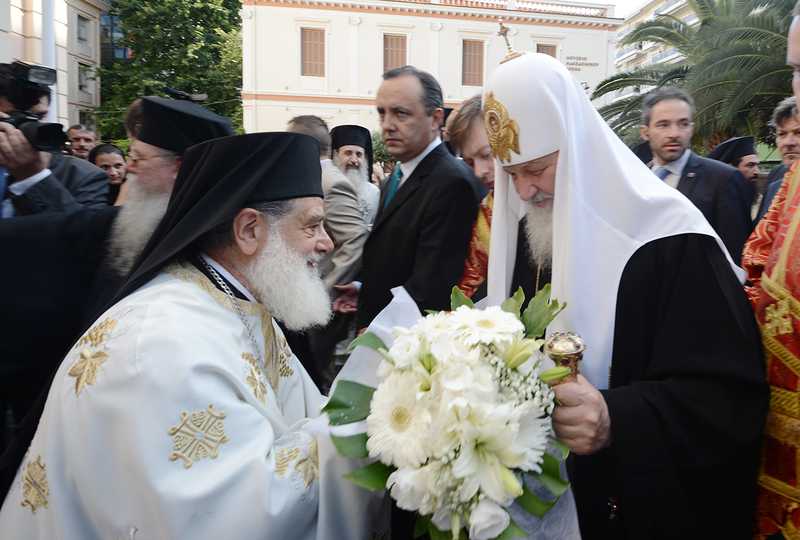 In his homily, Patriarch Kirill said that his visit to Thessaloniki was very meaningful to him as it is the native town of his heavenly patron, St. Cyril, the enlightener of the Slavs. ”Your city plays an important part in the life of Greece and of the whole Europe. I would like to note that Orthodox young people from many countries, including Russia, Ukraine and other states in the canonical responsibility of the Russian Orthodox Church, study at the University of Thessaloniki. “Thousands of pilgrims from these countries come to Thessaloniki every year. The Church tries to increase their number, as the more Russian Orthodox people come to this city, the stronger our ties become. “Many Pontic Greeks, whom we consider brothers, have taken refuge here. Thousands of them have spiritual ties both with Russia and Greece and are a real bridge connecting our countries and our Churches. No renowned diplomats can do for friendship and unity among nations more than people belonging to two cultures.